Geekvape Medusa RDTA Review - Daily Vaping Deals & The Best Vape Product Reviews at Vaping Cheap! Geekvape is known for releasing high quality and affordable vape products. Rebuildable dripping tank atomizers (RDTAs) have become extremely popular lately since they offer RDA type flavor, but has a tank reservoir so you don’t have to continuously drip. Geekvape has finally released their own RDTA, the Medusa which offers a much different design in comparison to other RDTAs on the market. Before getting any further, I would like to thank Heaven Gifts for sending me the Geekvape Medusa RDTA for the purposes of this review. I will go over my first impressions, building and wicking, performance, pros and cons and conclude with whether or not I recommend this atomizer! When I first received the Geekvape Medusa RDTA, I immediately noticed the familiar packaging. This is the same type of packaging that is found with most Geekvape atomizers, and this is certainly not a bad thing. The atomizer was kept securely, and I can easily say that you would have no worries when this product is in transit. Upon opening the packaging, you are greeted with the Geekvape Medusa RDTA. My first thoughts were that it is much smaller than what I expected. It does sport an overall base diameter of 25mm, but its height is only 38mm. Personally, I think it’s a good thing they went with a wider diameter, but shorter profile, it just makes this atomizer look great in my opinion. The overall design of the Geekvape Medusa RDTA is certainly eye appealing, and I really liked all of the markings that are found towards the bottom of the atomizer. 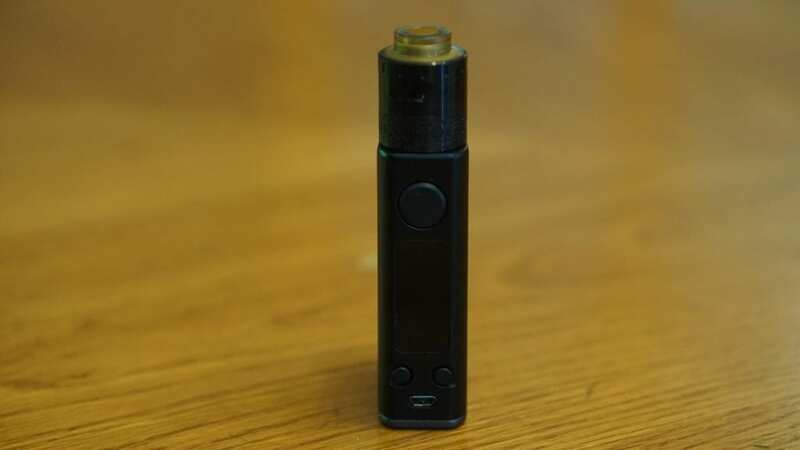 It does come with an Ultem drip tip, which doubles as a 510 drip tip adapter. This can be seen as a subjective con since some wider bore 510 drip tips may not like the greatest, but honestly, I didn’t mind it whatsoever. One con to be mentioned though is that the drip tip section does unscrew, but the threading is not stainless steel. I do wish the threading was stainless steel so that this would help avoid stripping. If you don’t take it on and off often then this might not be an issue for you. However, this is something worth mentioning. The Geekvape Medusa RDTA features a three piece design (four if you include the threaded drip tip) which are the top cap, airflow control ring and base. When I first tried to take everything apart it did take quite some effort since it was brand new, but I can say that after the first use it was just fine. What makes the Geekvape Medusa RDTA different from other RDTAs is that the juice well is not in a glass tank section like in most other RDTAs. You can think of it as an RDA with a very deep juice well. Honestly, this is the easiest way to explain how this atomizer is designed. 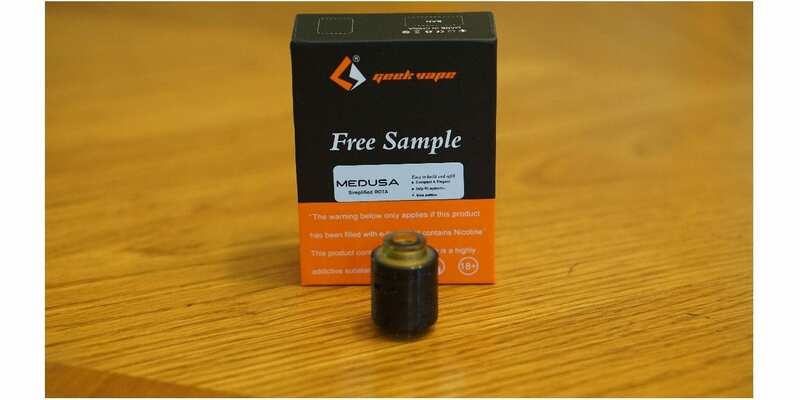 The Geekvape Medusa does have a 3ml e-liquid capacity, and you can easily fill it by pouring e-liquid into the side by where the wicks would go or in between the deck section and the outer section of the base. Also, you can paint e-liquid just like you would with an RDA if desired. Also, the Geekvape Medusa RDTA is designed where the top cap locks into place, and with this design it makes adjusting the airflow very easy. There is a lock symbol and unlock symbol on the base, so you can easily see where to line up the top cap. I do want to mention that there was little to no machine oil with this atomizer. One rinse with soap and warm water, and this RDTA was ready to go! In addition, the build quality of this atomizer is fantastic! All in all, my first impressions of the Geekvape Medusa RDTA were positive! It features a unique design, and it definitely stands out from other RDTAs. The Geekvape Medusa RDTA features a two post velocity styled build deck, which is one of the easiest, or the easiest build deck to work on. With that being said, I think both beginners and advanced users will have little to no issues when installing coil builds. With a velocity styled build deck it makes installing and centering coils effortless. 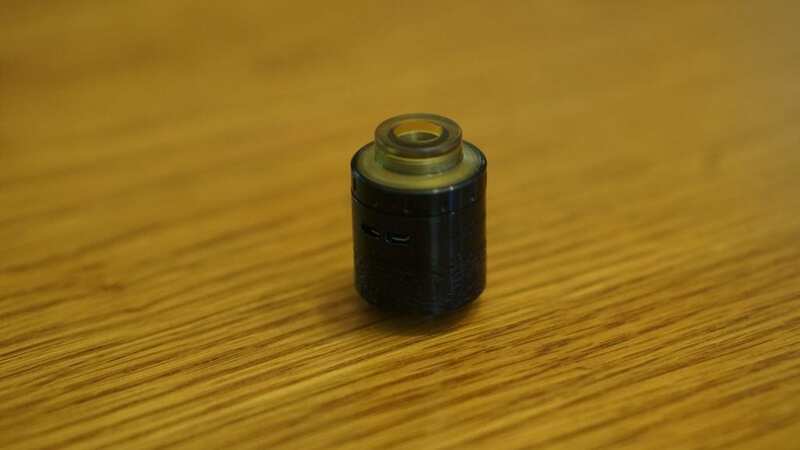 Since this atomizer does sport an overall base diameter of 25mm, it does have a pretty decent sized build deck. You can easily fit Fused Claptons, normal Claptons and Alien coil builds with no issues. Very large builds such as Staggered Fused Claptons may be a bit more difficult to fit, but I do think they should fit without much trouble. I do want to mention that this is a dual coil only RDTA as it does not come with a single coil adapter. This is a con to be mentioned, but not a major con to me since I do prefer dual coil builds. Wicking the Geekvape Medusa RDTA is a bit different in comparison to other RDTAs. Normally, I would wick RDTAs where the wicks barely poke out into the tank section. However, with this atomizer I find that having the cotton a bit longer where it barely touches the bottom of the juice well to be the most effective. 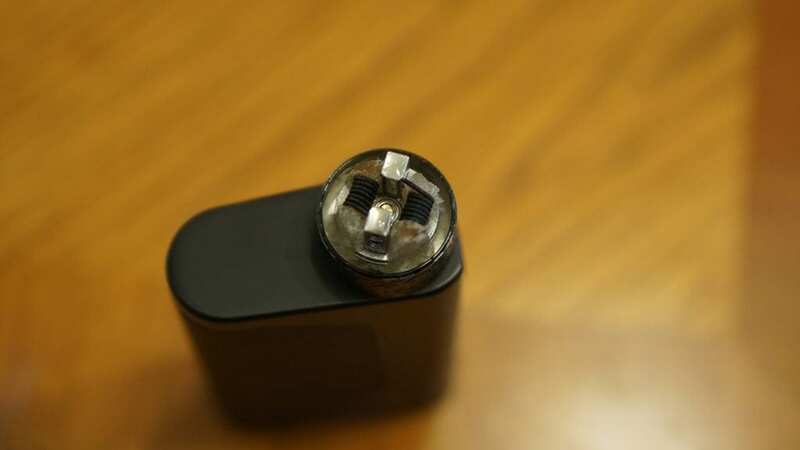 It really is easy to wick the Medusa, all you have to do is pull your cotton through the coil, make sure the cotton is not too snug nor too loose, and cut the cotton a bit longer than you would a typical RDA. Afterwards, simply tuck your cotton into the wicking ports, but make sure it’s not stuffed and you’re set! All in all, building and wicking the Geekvape Medusa RDTA is pretty easy. Like mentioned previously, both beginners and advanced users will have little to no issues with this atomizer. Building is easy due to the velocity styled build deck, and wicking is simple! Before getting into the overall performance, I’ll first go over my preferred coil build which was a simple dual Clapton build (24GA Kanthal/34GA Kanthal). The resistance of this coil build was about 0.32 ohm, and I would vape it between 50w and 60w. I did try other coil builds such as Fused Claptons and normal round wire builds which vaped great as well, but I preferred this specific coil build due to the wattage I would vape it at, and the warmth of it at these specific wattages. With a dual Clapton build I could vape it a lower wattages in comparison to a Fused Clapton build, which would give me better battery life, especially with a single 18650 device which is what I primarily used this atomizer with. With my preferred coil build, both the flavor and vapor production was excellent! The flavor was a lot better than what I expected, so that’s a huge pro right away. The vapor production is what you would expect with any other RDTA. When you install the top cap, and you turn it to the lock position, it automatically lines up the airflow with your coils. This makes it so that adjusting the airflow is simple, and the airflow is always in the right spot, which is once again a huge pro. Speaking about airflow, there is tons of it, and it will certainly satisfy most vapers. With the airflow wide open, there is barely any restriction to it. I would cut down the airflow to where there is one slot fully open, and one slot closed off about half way. This would add some restriction to the vape, and it did increase the flavor. With the airflow like this, the warmth up the vapor did increase as well, which is something I do enjoy. This is how I would primarily vape this atomizer. With a dual Clapton build I did experience some spit back. This is to be somewhat expected due to the coil build, but this is worth mentioning since some vapers will probably put some sort of Clapton build in this atomizer. With a normal round wire build, I didn’t really experience much spit back. I do want to mention that when the top cap o-ring gets e-liquid on it, it becomes extremely loose. This is definitely a con in my opinion, as the top cap can easily slip off when wiping it with a towel, and the airflow adjustment moves too easily as well. This is the sample version I received, so I would expect that this issue would be resolved with the final production unit. The included drip tip was comfortable to use, and did not get hot whatsoever. I had no urge to use any of my standard 510 drip tips, but it’s still an option if I wanted to use one, which is a huge pro in my book. Something worth mentioning is that you cannot drip e-liquid right through the middle to fill it, and the reason why is that when you install the top cap it does create a seal so that the e-liquid from the juice well doesn’t come leaking out when laid on its side or when upside down. When I did try pouring e-liquid down through the drip tip, I did experience leaking and that was simply due to user error. Filling this atomizer is easy though, simply take off the top cap and airflow control ring, and fill. This process can become a bit messy at times, as e-liquid tends to be all over within the top cap, especially with a Clapton build. All in all, the performance of the Geekvape Medusa RDTA was fantastic! The flavor and vapor production was solid, and it has tons of airflow to satisfy most vapers! In conclusion, the Geekvape Medusa RDTA is a fantastic performing atomizer that provides excellent flavor and vapor production! In addition, this RDTA features a unique design so it certainly stands out from other RDTAs on the market. I’m glad Geekvape went with this type of design, since many RDTAs do have a relatively similar design. The cons that were mentioned are none that would turn me away from this atomizer, and even though the top cap o-ring is not good whatsoever, I still deal with it since the vape quality is that good. Also, like mentioned previously, this is a sample unit, so the final production units may not have this issue! This is definitely an atomizer that will stay in my rotation for some time as the vape experience is that great in my opinion. The flavor and vapor production is top notch, and I do like the overall design. The locking feature is excellent and works great with literally no issues. Plus, the fact that when you do turn it to the lock position, it automatically lines up the airflow with your coils makes it the overall design that much better. All in all, the Geekvape Medusa RDTA is a solid performing RDTA that certainly differs itself from the competition with its design. If that is something that peaks your interest, then I can highly recommend the Geekvape Medusa RDTA!